Where to Buy Bonide Fog Rx Propane Insect Fogger, Bonide Fog Rx Propane Thermal Fogger 420 - $66.95 for Sale with Fast Free Shipping! Bonide Fog Rx Propane Thermal Fogger 420 produce dense fog that permeate foliage, cracks, crevices and other hiding places, quickly collapsing insect populations, leaving a safe, pest free environment for people, pets, plants and livestock without pesticide residue. When used in conjunction with bonide mosquito beate or bug beater insecticide fogs or other oil based fogging concentrate, you can use this. 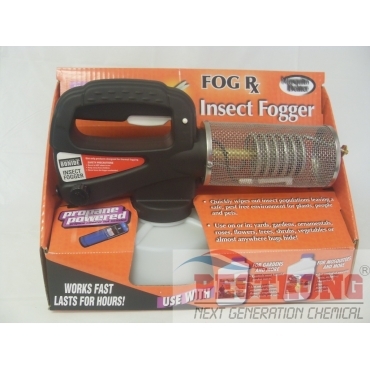 This portable and lightweight insect fogger can be used at picnics, outdoor events, camp sites, and for gardening treatments. Effective on mosquitoes, flies, black flies, gnats, and moths, protect your family and landscaping from annoying pests. Convenient propane thermal fogger with good price.